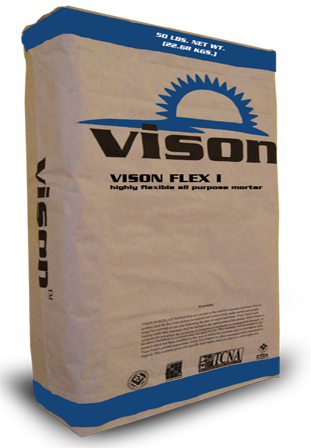 VISON FLEX I is a professional formula with high flexibility and superior bond strength. It’s an all- purpose mortar with outstanding adhesion to plywood subfloors. VISON FLEX I is also ideal for porcelain and glass tile installations. It can be used for interior or exterior floors, walls or countertops. TEXTURE: Powder consisting of Portland cement, polymer additives, graded silica sand, organic and inorganic chemicals. PACKAGING: 50 lbs. Multi-wall bags. VISON FLEX I may be used for setting absorptive, semi-vitreous, vitreous, non-vitreous (ceramic, mosaic, quarry, cement body tile) and impervious tiles. Vitreous, semi-vitreous or non-vitreous tile: ceramic, mosaic, quarry, cement body tile. Impervious porcelain and glass tile; brick and thin brick; cement-based precast terrazzo; natural stone tile. Not for installing green marble, other moisture-sensitive stone tile or resin-backed marble. Not for use over rubber, strip wood floors, oriented strand board, particle board, lauan plywood. For CDX plywood, temperature of area to be tiled must remain above 50°F (10°C) for 72 hours. Certain natural stone tiles may be affected by mortar shadowing or staining. For best results, maintain all tiling materials, substrates, room and adhesives at 50°-70°F (10-21°C) for 24 hours before and 48 hours after installation. In a clean mixing container, add 50 lbs. (22.68 kg) VISON FLEX I to 1 1/4 to 1 1/2 gallons (4.7 to 5.7 L) clean, cool water. Mix material to a thick creamy consistency, and then allow the mortar to stand for 10 minutes. All surfaces must be dry, structurally sound. Remove all grease, oil, dirt, curing compounds, sealers, adhesives or any other contaminant that would prevent a good bond. Glossy or painted surfaces must be sanded, and stripped of all contaminants. Concrete must be free of efflorescence and not subject to hydrostatic pressure. Concrete slabs should have a coarse finish to enhance the bond. Plywood flooring including those under resilient flooring must be structurally sound and meet all ANSI and deflection requirements. Ambient temperature should be maintained above 50° F (10° C) or below 100° F (38° C) for 72 hours to achieve proper bond. Concrete or plaster must be fully cured and must accept water penetration. Contaminants should be mechanically removed before installation. Concrete must be free of efflorescence and not subject to hydrostatic pressure. Concrete slabs should have a coarse finish to enhance the bond. Smooth concrete slabs must be mechanically abraded to achieve proper bond. All non-conforming surfaces such as strip wood, old plaster or painted surfaces can be covered with a cleavage membrane topped with a 3/8" - 3/4" (10 – 20 mm) reinforced mortar bed for walls and a 1 1/4" (32 mm) reinforced mortar bed for floors. After a minimum of 20 hours, the dry-set mortar may be applied to the mortar bed. Plastic laminate shall be sanded and well bonded to its substrate. Surface must be Portland cement bond compatible, the old surface must be well bonded and without waxes, sealer, or coatings. Smooth or slick surfaces will be heavily scratched, scarred, coarse sanded or abraded to provide mechanical bond. Install expansion joints around all perimeters or restraining surfaces where possible to allow for expansion movement. Expansion joints and cold joints, as described in ANSI A108.01, should never be bridged with setting material. They must be brought through the tile work and filled with an appropriate elastomeric sealant. Contact Vison Tech’s Technical Services for the proper treatment of control or saw cut joints. Refer to TCNA EJ171, F125 & F125A. Use a properly-sized notch trowel to ensure proper coverage under tiles. Using the flat side of the trowel, apply a skim coat of mortar to the surface. With the notch side of the trowel held at a 45° angle, apply additional mortar to the surface, combing in one direction. Press the tile firmly into place in a perpendicular motion across ridges, moving back and forth. The perpendicular motion flattens ridges and closes valleys, allowing maximum coverage. Tiles with deep patterns, high lugs or those with irregular texture on the back surface may require "back buttering" to ensure 100% coverage of back of tiles. Proper method of bonding of tiles requires embedding, pressing and sliding tiles perpendicular to wet mortar ridges to have a nominal mortar thickness of 3/32" - 3/16" (3 - 5 mm) and 100% coverage. During the setting of tile, it is advisable to occasionally remove a tile to be sure mortar has not skinned over and sufficient transfer is being made. Do not adjust tiles in mortar after they have been set past 10 - 15 min. Smaller tiles will use smaller notched trowels and larger tiles will require larger notched trowel suitable for providing a minimum 3/32" - 3/16" (3 – 5 mm) bed thickness after embedding the tile. Approximately 2 - 3 hours, depending on ambient temperature. Grouting may be accomplished when tiles are held firmly in place, typically 16 to 24 hours after installation is completed. No traffic is permitted over the tiles prior to grouting. Cold temperatures or high humidity may extend curing time. Unglazed tiles may require sealing prior to grouting so discolorations will not occur.